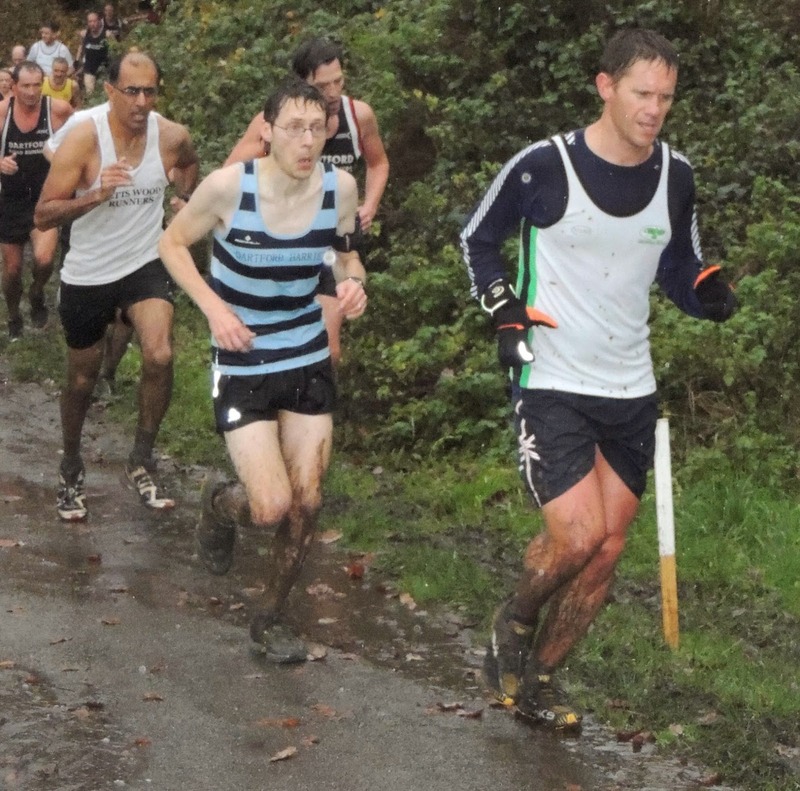 The 2014/15 Kent Fitness League season consists of a series of seven 5-6 mile cross-country races over the winter months and is only open to non-elite runners who are members of one the 18 affiliated clubs. My first claim club, SLGR, are not one of the league's affiliated clubs, but I am able to take part in the series by running for my second claim club, Dartford Harriers (Hoops!). The 2014/15 series had started before I had joined Dartford Harriers so I was not eligible to enter the first two races (Knole Park / Swanley Park). So the third race of the series, hosted by Plumstead Runners at Oxleas Wood became my first appearance in the famous hoops vest! Oxleas Wood is one of the few remaining ancient deciduous forests in the Royal Borough of Greenwich and is nestled onto the southern face of Shooters Hill. On the day, I arrived at the venue, parked on Rochester Way (the old A2) and headed up towards the cafe, which is where the rest of the Harriers had planned to meet. The weather was a bit nippy, but actually quite mild considering this race was held in mid-November. And it rained non-stop for the entire morning. I had my name added to the official list of Dartford Harriers runners that were competing on the day and after a quick pit-stop in the toilets behind the cafe, I joined some of the other Hoops for a warm up on part of the course within the woods. Returning to the cafe covered in mud, I dropped off my completely non-waterproof jacket and headed down towards the start line. The start was at the lowest point of the wide triangular shaped grass area called Oxleas Meadows which conceals an underground reservoir that provides fresh water to the local area. 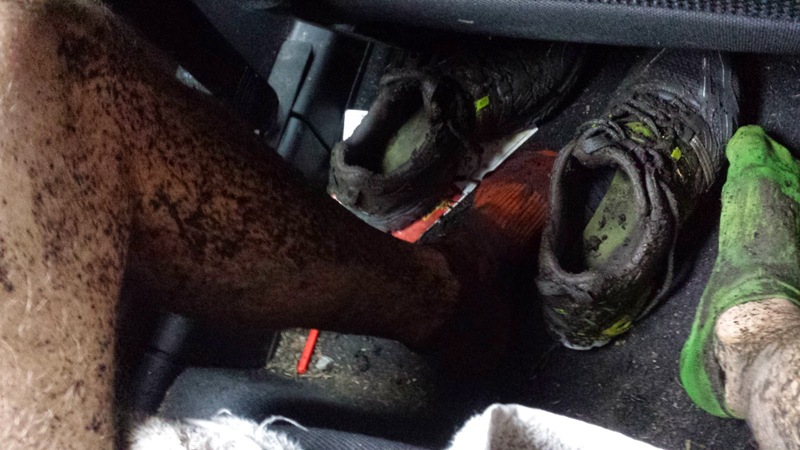 As I looked around and saw a lot of runners wearing spikes, I did start to worry that I could find myself on the wrong end of one of them in the stampede through the waterlogged grass that followed when the race was started at 11am sharp. With this thought in my head, I probably took too much of a cautious approach at the start and as the course took us all to the top of the hill before swinging us around and sending us back down it, I found that I was miles adrift from where I thought I might be in the pack. A minute or so later the course crossed over the footpath and into the western half of the wood which involved everything you might expect to find on a course that goes through the woods. There were tree roots, stones, logs across the path, branches and twigs trying to poke your eyes out. There were slippery paths that went up and down as well as twisting all around. There were mini streams running down the inclines, there was even some steps to run down, then there were puddles and plenty of MUD - this is cross-country after all! The first half of the wood contained a few steep inclines and eventually the course popped out of the western half of the woods, up another incline, and round the back of the cafe before heading down into the eastern section of the woods. This section featured more of the same features and after lots of splashing (some of those puddles were a lot deeper than they looked! ), twisting, sliding and weaving, the half-way point was reached. Rain and glasses don't mix very well (I really should try wearing a cap) so I found myself with reduced vision due to them being covered in rain water. Common sense probably suggests taking them off, but the world is just as blurry without them. So I ended up just leaving them on and doing my best to negotiate the course without falling over and hurting myself. As the race progressed I was slowly moving through the field, but not quite enough to give me a great finishing time and position. The second half of the race was a repeat of the first lap, and it was back onto the waterlogged grass for second helping of the opening hill (which felt steeper now that the fatigue had begun to set in), down the hill and back through both sections of the woods with the other tough incline in between them. Once reaching the exit of the eastern woods for a second time, a friendly marshal pointed in the direction of the finish - at least I think they did, I couldn't actually see much at all at this point. Somehow I managed to find my way towards the finish, but I was really just winging it and hoping for the best! I made out an image of what looked like the finish area so headed straight for it. Thankfully it was the finish and once across the line and in the funnel I was marked in and handed a raffle ticket with my finish number on. I had to give this to my team captain so he could collate our results. I met up with a few of the other Harriers runners and headed back up towards the cafe to retrieve my jacket. By this stage I was covered in mud, shivering uncontrollably and putting on a dripping wet, completely non-waterproof jacket didn't really help much. So instead of hanging around for a tea and chat, I sensibly got myself back to the car where I put the heating on full blast and got changed into some dry clothes. It turns out that one of my Dartford Harriers team mates won the race [results] in what must have been quite an exciting finish as the top three were separated by only 3 seconds. We were also first placed team overall. My own run was somewhat disappointing as I finished way back in 82nd position out of 384 runners. Such is the strength of the team, I was way off being in with a chance to actually contribute to the team's overall score. 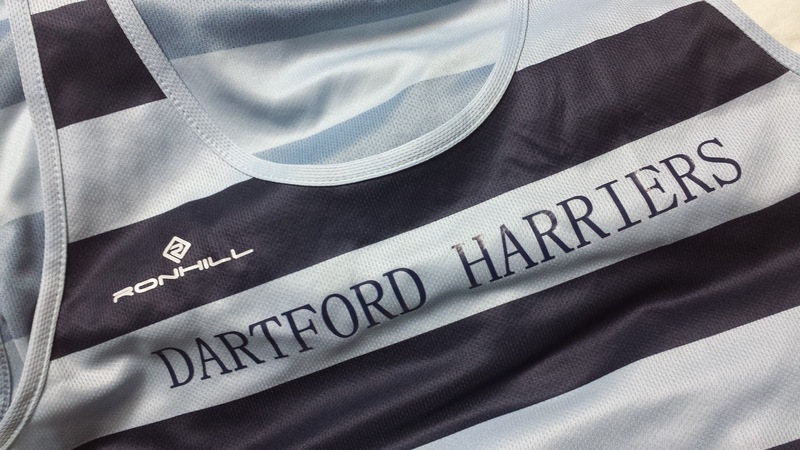 It was great to finally be able to participate in the league and I really felt a sense of pride in wearing the team's colours - it's difficult not to feel this pride when you consider the history of the Dartford Harriers goes back to 1922 and has produced some amazing athletes. I really hope I can make it to the rest of this season's Kent Fitness League races and I hope that I can improve on this performance as the season progresses.